Mining industry management systems developer VIST Group, whose daughter company VIST Robotics is a resident of the Skolkovo Foundation, has sold a majority stake to Zyfra, a company developing solutions to digitalize industry, Skolkovo’s press service reports. The deal, worth RUR 2 bln ($30 mio), is due to be closed in 2020. The funds will be invested partly in developing VIST Robotics’ Intelligent Mine project, a complex solution for unmanned surface mining using self-driving vehicles. A significant part of the investment will be spent on perfecting ongoing R&D projects: driverless vehicles and robotic machinery for mining, the creation of a digital platform, the introduction of artificial intelligence, and the development of solutions based on predictive analytics, the companies said. The money invested by Zyfra will also be used to expand the company’s international activities and to boost sales of VIST Group products on international markets. VIST technology is already in use in countries including Morocco, South Africa, Kazakhstan, Mongolia, Vietnam and Indonesia, and sales outside Russia and the CIS currently account for 20 percent of the company’s total sales. VIST Group expects to see turnover grow by 20 percent this year to RUR 1.4 bln ($21 mio). That figure is expected to double by the end of 2020, driven by international sales, driverless and robotic technology, and the use of the Industrial Internet of Things (IIoT), according to the company. Zyfra, which was founded in November 2017 and combines data science with industrial expertise to provide end-to-end solutions for industries including machinery, metallurgy, oil and gas and mining, currently operates in Finland, China, Russia, Bulgaria and India. 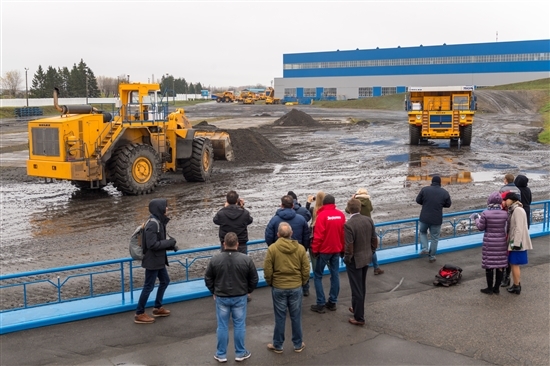 VIST Robotics earlier this month unveiled its autonomous industrial loading and transport system for the mining industry at a testing ground in Belarus, using earthmoving equipment made by BelAZ. In 2017, VIST Group and its daughter company VIST Mining Technology – a resident of the Skolkovo Foundation – signed an investment agreement with an international venture fund under the management of I2BF Global Ventures and VTB Capital Asset Management. This year’s deal in which Zyfra is buying VIST Group is an excellent example of the company’s growth and its establishment on the international market.